Click the image to see more detail. 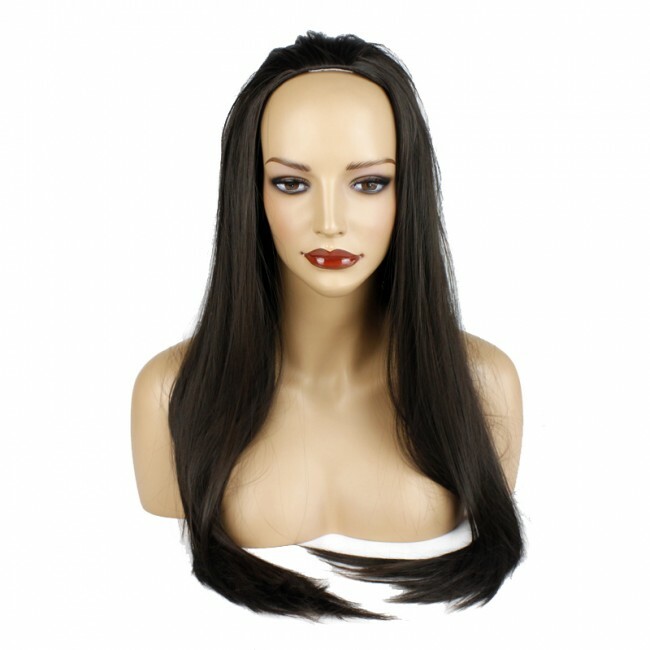 Gorgeous, long and gently layered with a straight look 3/4 hair piece / half wig which adds instant length and volume and fits in naturally with your own hair. 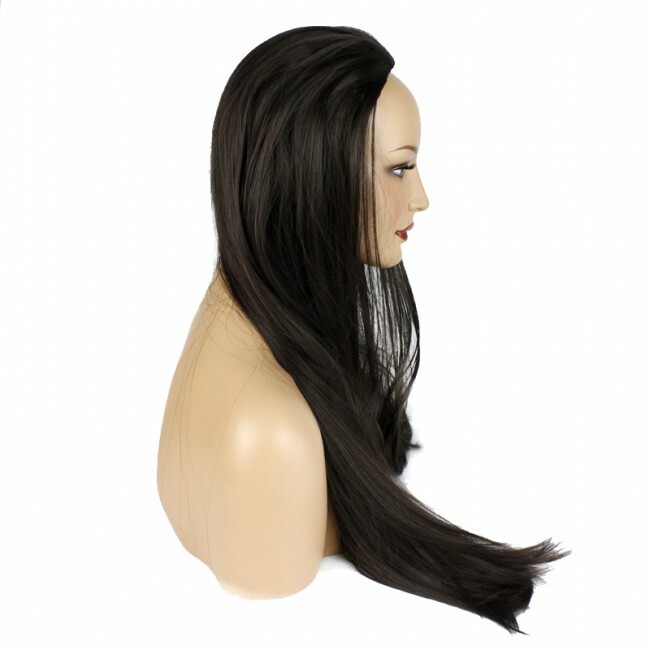 Material: Top Quality Heat Resistant Kanekalon Synthetic Hair, feels silky and soft like real human hair. EASY TO FIT: Adjustable size to fit heads approximately 20" to 23". This is over 90% of heads. You can adjust the hook inside to get the optimum fit. No need for pins or tape. Reusable, Washable, Will keep style even after washing, styles are baked in. You can tie up with a hair clip to make a ponytail or scrunchie for special occasions. 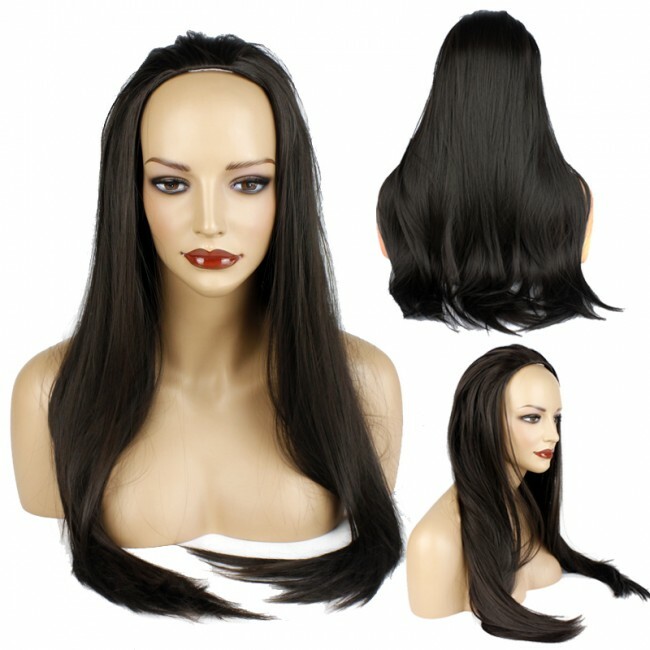 3/4 Wigs (Also known as 1/2 Wigs) If you have been thinking about the celebrity hair explosion, and how they look so great then you have come to the right place. Our stunning 3/4, 1/2 wigs produce a gorgeous mane of hair and are really easy to wear. They come in Curly, Wavy and Straight styles and are a brilliant way of changing your look to give you a stunning elegant style. It only takes a few minutes to put on- they clip into your hair with a comb, quickly giving you the hair you desire. Gorgeous, long and gently layered with a curly curl 3/4 hair piece which adds instant length and volume and fits in naturally with your own hair.which adds instant length and volume and fits in naturally with your own hair. 3/4 Wigs If you have been thinking about the celebrity hair explosion and how they look so great then you have come to the right place. 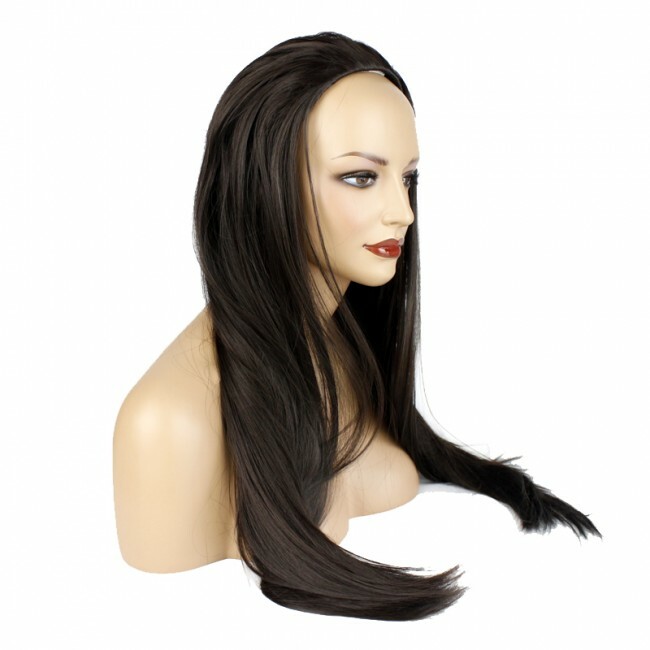 Our stunning 3/4 wigs produce a gorgeous mane of hair and are really easy to wear. They come in Curly, Wavy and Straight styles and are a brilliant way of changing your look to give you a stunning elegant style. It only takes a few minutes to put on and they clip into your hair with a comb, quickly giving you the hair you desire. No need to style just shake and go! Fabulous Shades made for blending with your natural colour Just Experiment you do not know until you try! Style Guide: You can tie up with a hair clip to make a ponytail or scrunchie for special occasions. Adjustable head size size to fit heads approximately 20" to 23". This is over 90% of heads. You can adjust the hook inside the get the optimum fit. No need for pins or tape. We dispatch any order made before 2.00 pm on the same working day (weekends, public holidays and bank holidays are not considered as a working day). Orders placed after 2.00 pm will normally be posted on the next working day. We use for tracked orders a regular update service, so you will be emailed on the progress of your order as it is processed, so you can be sure of what is happening. We want your shopping experience to be enjoyable and worry free. Therefore we made the return process, very simple, No small prints, No pages long documents. For a refund or exchange, please simply fill in the return form arrived with the product, and send it back to the return address. we will process the refund or exhange straight away once the return arrives. We will exchange the item for you without charging any extra postage as many times as necessary to obtain the correct product..